Why wait for the weekend? 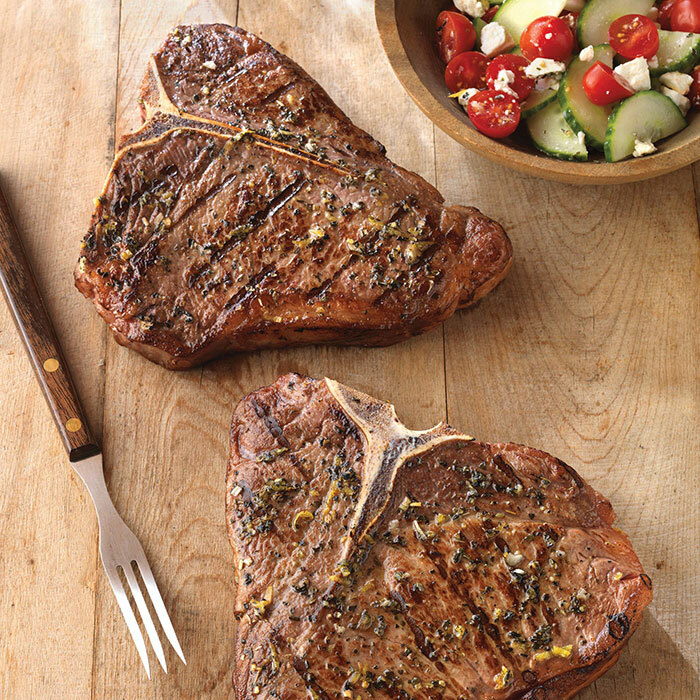 Put these incredible Greek-seasoned T-bones on your grill tonight and enjoy! Grate peel and squeeze 1 tablespoon lemon juice. Combine Greek seasoning and lemon peel. Reserve 2 teaspoons mixture for salad. Press remaining mixture evenly onto beef steaks. Place steaks on grid over medium, ash-covered coals. Grill, covered, 11 to 16 minutes (over medium heat on preheated gas grill, 15 to 19 minutes) for medium rare (145° F) to medium (160° F) doneness, turning occasionally. Meanwhile, combine reserved 2 teaspoons seasoning mixture, lemon juice, cucumber, tomatoes and cheese in medium bowl, stirring to combine. Season with salt and pepper, as desired. Remove bones; carve steaks into slices. Season with salt, as desired. Serve beef with cucumber and tomato salad.